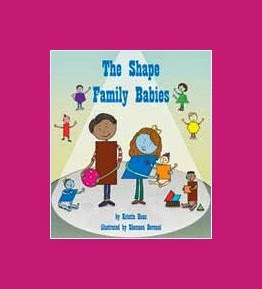 The Shape Family Babies by Kristin Haas and Shennen Bersani is one of the newest spring titles from Arbordale Publishing (formerly Sylvan Dell). Mr. and Mrs. Shape are awaiting their newest arrival, but they end up with more than they bargained for when three baby shapes arrive! Mother Rhombus and Father Rectangle search for the best names for all three in this fun math adventure. 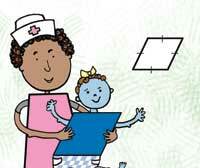 Readers are introduced to geometry concepts in this picture story book for early learners. The Shape Family Babies demonstrates how fun it is to cross the curriculum and use "different" resources like picture books for textbook-heavy subjects like math. Plus, language arts, math, and reading comprehension are all combined, so young learners are immersed in the concepts presented. Though the font is large and the sentences are short, I read this book aloud to my son the first time so that I could point out the new vocabulary words to him and not overwhelm him with trying to figure them out on his own. After one reading, he was ready to read it on his own and was soon giving me facts about polygons and angles. The "For Creative Minds" section in the back of the book contains geometry activities on shape parts, quadlilaterals, and shape matching. And the Arbordale Publishing website has a free downloadable teacher resource with lesson plans and more to turn this book into a unit study.